Super-talented Sue is the flower power house behind this florist and really knows her ‘stuff’ having worked in the industry for years. Sue specialises in everything from weddings to workshops working out of The Old Butchers Shop in Sutton Valence. 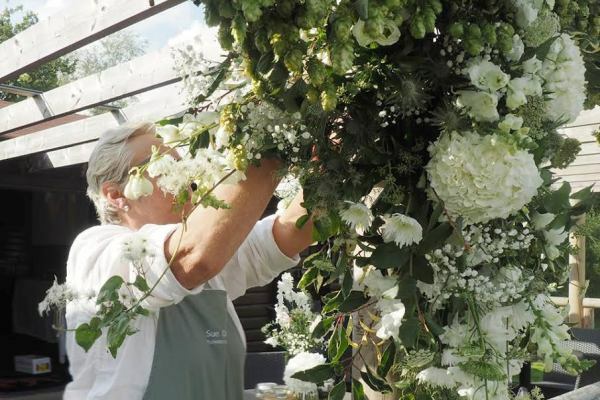 Her life-long style of using informal, wild, garden and hedgerow flowers and greenery has come full-circle with current wedding flower trends, growing many varieties herself for summer picking. Sue offers an initial no obligation meeting with clients at her workshop in The Old Butchers Shop, Sutton Valence to discuss ideas, colours, flower styles and price. Whether you are looking for flowers to adorn your venue, church, marquee, or simply looking for just bouquets, she will guide you through to ensure that all your expectations come to fruition beautifully. Recently, Sue has introduced an amazing range of outstandingly natural looking artificial flowers to her repertoire, alongside her large range of pots and containers. Offering a full range of gift arrangements or something specially designed for your home and beautifully crafted artificial wedding flowers for those who are travelling off to a beach to tie the knot!! Her very informal workshops in Sutton Valence have been a huge success, where everyone leaves smiling. All details are available on the website (details below) where you can also register if you are interested in attending. Sue also is known for the most exquisite funeral designs in memory of loved ones; personalising each one by using their favourite flowers and colours or even simply a mixture of flowers from their own garden. The Old Butchers Shop, Broad Street, Sutton Valence, Kent. ME17 3AJ. Open – every Tuesday 10am to 5pm or by appointment at any other time - just call or email.